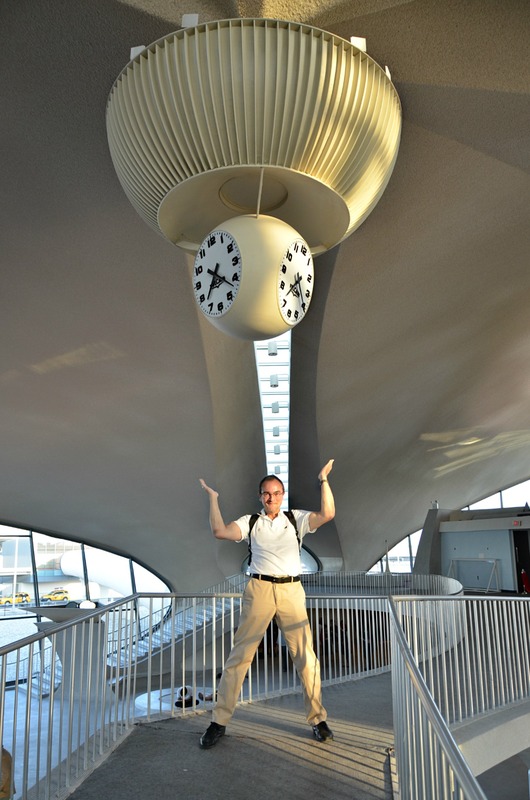 Photo of the day: I GOT TIME ON MY HANDS – Time seemed to stand still in the year 1962 during my private tour of the TWA Flight Center in New York’s JFK airport. The flowing timeless architecture by Finland’s architect Eero Saarinen makes you feel as if you are floating through the space, which was his idea. He said he wanted no focal point at all, just sweeping vistas. Therefore, the clock was an added idea on the part of TWA (Trans World Airlines) insisting a clock be placed somewhere within the terminal. Here it is above the floating central bridge/walkway. Sadly time did not wait for Eero Saarinen, he died shortly before his building was completed. But time actually has stood still here today, since the building has been officially landmarked and is slowly being renovated for Jet Blue airlines. This entry was posted on June 23, 2013 by newyorkcityinthewitofaneye. It was filed under DAILY PHOTOS WITH STORIES OF NEW YORK CITY and was tagged with 1962, aviation, Eero Saarinen, Hans Von Rittern, Jet Blue airlines, JFK airport, Mad Men era architecture, Manhattan, New York airport, New York City, New York photo, Photo of the day, Queens, TWA Airlines, TWA Flight Center, vintage airline terminal.